An off-duty West Allis firefighter who was attacked by a random person while trying to save a woman's life in West Bend, gets a huge thank you. 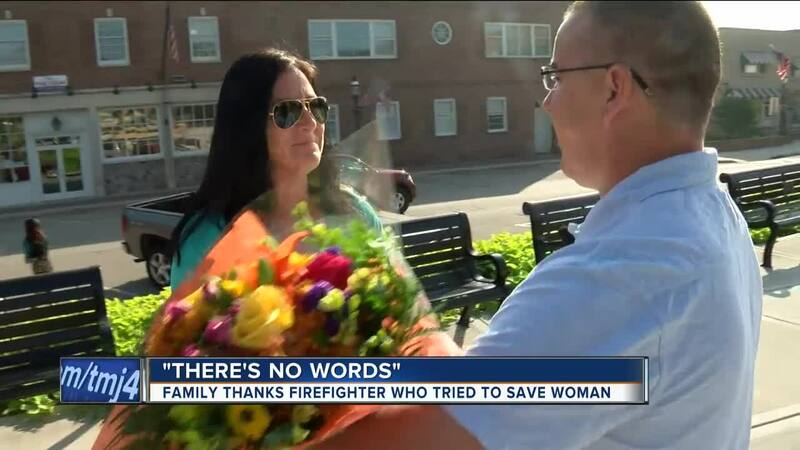 WEST BEND -- An off-duty West Allis firefighter who was attacked by a random person while trying to save a woman's life in West Bend , gets a huge thank you. You may remember, a random person struck the off-duty West Allis firefighter in the back of the head as he was giving CPR. That victim's family came back to West Bend to meet him. We were there as firefighter and EMT Chad Staszak gave 85-year-old Arlene Wendler's children flowers as condolences. Staszak tied to save Wendler's life at Germanfest in West Bend last month. Sadly, she did not make it. "I tried my best," said Staszak. "Thank you that's all you can ask. thank you, I appreciate it," replied Gloria Bader. Gloria came with her sister Joyce to tell him about their mother he tried to save. "She loved her family her family was the number one priority," said Joyce Gebert. Photos that were taken moments before Arlene collapsed show her dancing at Germanfest. Chad noticed her smiling face before anything happened. They did not realize he had tried to save her life, or that he was attacked by a random person in the process until they tuned into TODAY'S TMJ4. West Bend police say that blow to the head came from 32-year-old Robert Patrick Ryan, a bystander with no relation to the woman in trouble. "My daughter called and tried to contact somebody from TMJ4, and said 'Hey I think this was my grandmother, and we'd like to meet him,'" said Joyce. Now they hope to stay in touch.